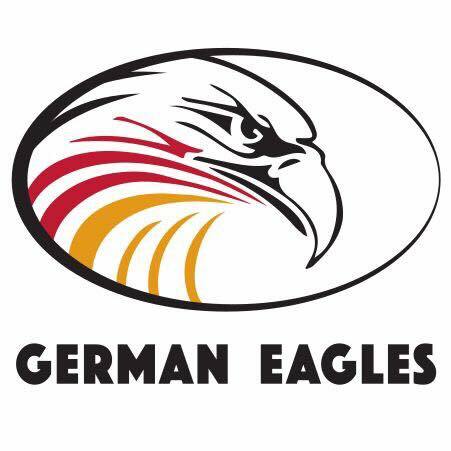 Although they are one of Europe's older footy national sides, with a domestic scene dating back over 20 years to the mid-1990s, the German Eagles are making their International Cup debut this year. The Eagles have made big strides forward in the past few years, achieving 3rd place at last year's European Championships after narrowly defeating Sweden in their final match. This year their experience against other European nations, including Div 1 outfits such as Great Britain, means they look to be serious contenders in Division 2 of the IC17. Footy started in Germany in the 1990s, with the foundation of the Frankfurt Redbacks by German footy pioneer Malte Schudlich, and the foundation of the Munich Roos down in Bavaria. These were joined by the Berlin Crocodiles later in the decade, followed in the years thereafter by the Hamburg Dockers, Rheinland (originally Düsseldorf) Lions and Stuttgart Emus. The AFLG national league kicked off in the early 2000s, at one point also including French side the Strasbourg Kangourous, from just across the border. Recently, the established clubs have also been joined by the Dresden Wolves, who had also played against the nearby Czech sides based in Prague, and the Freiberg Taipans. A number of the AFLG clubs also host metro comps, as is common the world over, where distances between clubs make a local option attractive for recruiting new locals. The Eagles have had some success in the European scene, with appearances at the past few European Championships, their 3rd placing at the 2016 edition (behind Ireland and Great Britain) being their best to date. In 2013 they defeated the French national side by 90 points in a European Championship warmup, a good omen considering the French went on to be competitive in Div 2 of the IC14. Coaching the side is Australian expat Mark Woods. Woods previously played over 150 games for the Monash Blues in Melbourne VAFA competition, then after moving to Germany won the league best and fairest in his first season with the Munich Roos. He credits his attitude towards growing the game in Germany for his being asked to coach the side. "The players are proud and driven to be the best, and to do so we need to compete and see and learn from the teams in Europe but also the world. Ambition is a three part thing: firstly the ambition is to follow the team focus/rules, secondly to be competitive against any opposition we come up against and gain respect in the doing and thirdly to grow the sport of AFL in Germany, so that we can get stronger as a country," Woods says. As this is their first appearance at the International Cup, it remains to be seen how they travel. One issue may be a lack of depth if hit by injuries, as two players of their original squad have already been ruled out through knee and back injuries. Selection was also limited by availability. As Woods says, "Almost all clubs are represented in the national team. The competition is in the growth phase and there are many students in our squad. We are therefore limited by budgets, time off and injuries, so selection is a cross between selecting the best possible team and availability of the best possible team. This being said, we are a team and will always play as such." The squad is more or less fully home-grown - there are are one or two squad members who are currently playing in Australia, however each has played in Germany until recently, with no real long term Aussie-based players. Host club in Melbourne are the North Sunshine Roadrunners, who will host the Eagles for training sessions and a practice match pre-tournament, which should give them a further edge. The bottom line is that the Eagles should be looking to perform strongly in Division 2. They would be hoping to go in as favourites over first-up opponents Pakistan and India, with the experienced Japan side in the third round being the main thing standing between them and a shot at becoming Division 2 champs. The key players to watch are captain Florian Naumann (CHB/On ball) and Jakob Jung (Centre, RR). Naumann has experience as a goalkeeper in both soccer and handball, whilst Jung has been a long-term German footy stalwart, who learnt the game as a high-school exchange student in Bribie Island, Queensland in 2009-10, and was profiled by WFN in this article a few years ago. Woods reports that Naumann and Jung will form the key leadership group along with Martin Schüttoff. After so many years waiting (as they focused on local development) it's great to see Germany finally coming to the International Cup. Welcome to Australia! Hopefully some competitive matches, great memories and maybe some of the young players will become strong advocates for the game for years to come.